The city’s “statement of basis and purpose” of this proposed rule states that it’s to reduce food sources available for rats, prevent harmful interaction with animals in parks, support healthy wildlife nutrition and reduce the maintenance burden on Parks staff. While healthier food is preferable for all New Yorkers, but some food is better than none. Our city parks are not the wild; they have been landscaped for human pleasure with minimal thought to the wildlife that reside there. Trees and plants that bear nuts, seeds and fruit are non-existent in many parks and have been replaced with non-native trees and ornamental plants that provide no natural food source. 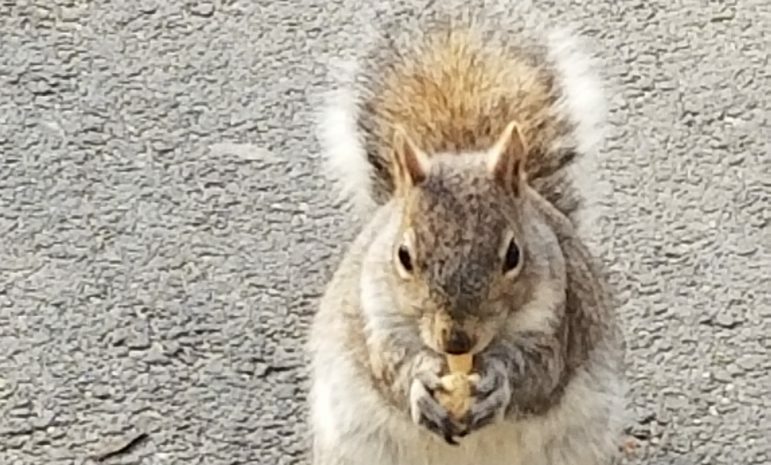 If adopted, this rule would eliminate the bird and squirrel feeders as an alternate food source, and result in starving those animals or forcing them to eat garbage, which is more far more unhealthy. Parks attribute the rat problem to animal feeders. But feeders’ seeds, nuts and bread are eaten up by hungry birds and squirrels during daylight hours. Meanwhile, there is litter all over the grounds with full and open bins of trash left overnight. That is an open buffet for our rats. Just to blame feeders as a burden on Parks maintenance staff is wildly unreasonable. New Yorkers for Park’s “Play Fair” campaign right advocates for additional funding for parks maintenance and highlights the deep need for gardeners and other park workers. Although city parks make up 14 percent of NYC land, the agency received a meager half of 1 percent of the total city budget last year. Nothing can demonstrate the mean spirited nature of this ban more than the effect it would have on feeders such as Liliana Berezovschi, a 75-year-old woman with stage 4 cancer. In her letter, published in the Daily News, she states how feeding the birds in her park is therapeutic for her. On top of everything else, she now lives in fear of this rule being adopted. Now feeders will be criminals, by definition, if they break the law and continue feeding the birds and/or squirrels they have cared for. Some homeless and/or undocumented residents may be targeted and this will pose catastrophic consequences for them. Lastly, this is bad for nature, in general. A recent report produced by World Wildlife Fund for Nature (WWF) with 59 scientist-authors reported that humanity has wiped out 60 percent of animal populations in less than 50 years. This past month, it was reported that “Britain’s national parks risk losing UN Nature reserve status because wildlife is dying out so fast.” As a city and especially in our city parks, should we not encourage the pubic to care for our wildlife and provide them a helping hand, especially when we have already taken most of their habitat for our own purposes? Roxanne Delgado is a member of Bronx Animal Rights Electors. Heartless and Unjustifiable. Our Former Commissioner Henry Stein, RIP, stated ” I will be the Commissioner for good times for people, plants and animals.” “I will be the man for ALL species” . . What has happened to our Parks??? Trees and animals now gone from many of our parks and for what? more eating establishments inside our parks. Even a filthy hamburger joint in Madison Square Park, reaping the $$$ from public lands. Pablo – I am not a resident of NYC but I am fighting for this ridiculous law trying to implement. What kind of people are they ! The idea is so short sighted and not even smart thinking. Wildlife animal don’t need your help! There are a tons of natural foods out there in the parks…you think feeding them bagel, pizza, bread will be better for them? No, is just like if you feed your dog human food, your dog will get sick! There are tons of scientific papers out there that you don’t look it up, but you only quote the UK person that is beneficial to your view point. When you are feeding wildlife in general, you are also feeding all the other critters like cockroach and rats, and making the city a dumpster. If you DON’T feed them in the first place maybe they will be better off and not die off with disease, crowding and competition. These unnatural conditions increase the chances of fighting and injury among animals. It can also increase the spread of diseases, some of which may be transmitted to pets and humans. If you wish to sustain livestock then you will have to take care of it full time, in which case random feeders should still be banned and professional staff should feed the animals. Either way randomly feeding animals, wild or otherwise is NOT good for the animals. Just ask all the incredibly unhealthy cats and dogs who are already overfed in NYC how their livers are doing. Just as it is for humans, over feeding as well as feeding simple sugars and carbs (white bread) is bad for the animals. (squirrels and ducks should not eat bread). Just stop trying to justify your bad habits.